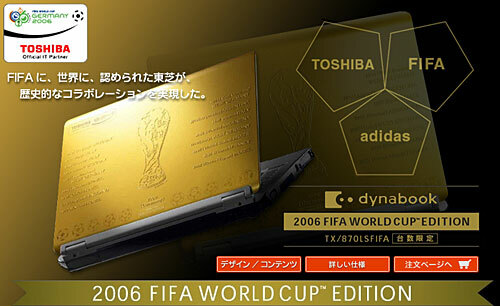 Toshiba's the official IT partner of FIFA for World Cup 2006, so it makes sense that they'd launch a limited edition laptop commemorating the event—but we sure didn't expect it to be, you know, quite so gaudy. Slathered in gold paint and retailing for ¥199,800 (around $1,737), each of the 600 units has exclusive World Cup desktop wallpapers and icons inside and the hosts and winners of previous World Cups embossed on the cover. Our Japanese isn't so great (and frankly neither is Google Translate's) but as far as we can make out, it looks like after the conference Toshiba will be issuing a serial plate with the winning country on it plus the laptop owner's name and the unit's serial number as a belated present to all the buyers.